These are a few of my favourite things! December marks the official start of the holiday season; whether or not you’re ready, Christmas is less one month away! For those of you still shopping around — or waiting to start shopping, natch — here are a few helpful ideas, taken from the wish list of yours truly. Indulge me for a minute, people. 1. Set of Three Swarovski Crystal Brooches ($355, Net-A-Porter): I love the vintage-inspired feel of these brooches. And what’s even better than one? Three! You can wear these Marni Swarovski crystal brooches separately or clustered together as a set. Perfect for your daytime or evening look, these embellished brooches will add instant character to almost any look. 2. Portolano Camel Leopard-Print Suede Gloves ($120, Bluefly): Anyone who knows me knows that I absolutely adore cashmere and leopard-print. Put the two together in a pair of fabulous Portolano gloves, and you’ve got a match made in winter weather Heaven! Leopard-printed suede with cashmere lining, these Portolano gloves are as functional as they are fashionable. 3. Coach Gramercy Patent Wallet ($198, Coach): I’ve been blessed with lots of Coach goodies so far this year, so it’s no surprise that this pink patent leather wallet has captured my attention. With Op Art embossed leather, this wallet is signature Coach, and it’s appropriately sized to fit all your credit cards and greenbacks. 4. Hooded Cashmere Cardigan and Ribbed Leggings Set (on sale $250, Neiman Marcus): Any woman with a love for cashmere — and let’s be honest, isn’t that all of us? — will swoon for this über-comfy cashmere lounge set from Neiman Marcus. A hooded zip sweater with a cute tie waist and matching ribbed leggings? Luxury in a pajama set, really. It looks as good as it feels (and seriously, it feels good). 5. 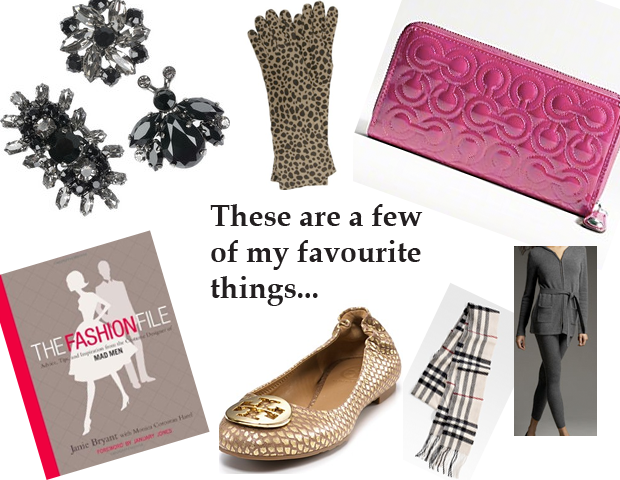 Burberry Giant Checked Cashmere Skinny Scarf ($249.45, Saks): Again with the cashmere (a girl can never have enough). This Burberry giant checked scarf is absolutely adorable. Available in five fun colours — check that purple-y plum! — this is one piece you’ll accoutre yourself with season after season after season after… you get the point. 6. Tory Burch Reva Metallic Crackled Snakeskin Print Ballet Flats ($235, Bloomingdales): Tory Burch’s Reva flat has been a sensation for some time now, which tells me it’s more timeless than trendy. These slip-on ballet flats have an eye-catching crackled snakeskin print, and they’re so easy to wear. And what would a Tory Burch design be without said designer’s goldtone metal logo medallion? These are a pair of shoes for the ages. 7. The Fashion File: Advice, Tips, and Inspiration from the Costume Designer of Mad Men by Jane Bryant (about $18.80, Amazon ): What would any Christmas wish list be without a little educational reading? I’m eager to open the hardcover edition of Mad Men costume designer Jane Bryant’s book. Bryant’s a genius, if you ask me, and her creations for the hit AMC show are unmatched. Jane Bryant’s book goes into the dressing room of Mad Men and reveals the creative process behind your favourite characters’ styles. It also proves what I’ve been saying on my website since I started: Dressing well never goes out of style.